Steps on how to set up a domain. Communities that have an active subscription to the deluxe plan are eligible to set up a custom domain on their website. Once your first payment has been processed you'll have an active subscription and a new message will appear in the Admin Control Panel. Click the "Set one up now" link found in that message to be directed to the domain setup page. Select "New domain" and enter the domain name that you'd like for your website. Then select the correct extension from the drop-down menu. The domain name that you enter must be available and not already registered. To check availability, we recommend using a tool like Domainr. Once you've finished filling out the information on this page, click the "Create" button. Our system will process your request and will typically complete the setup within an hour. All administrators with the "domains" privilege will receive an email once the domain is active. 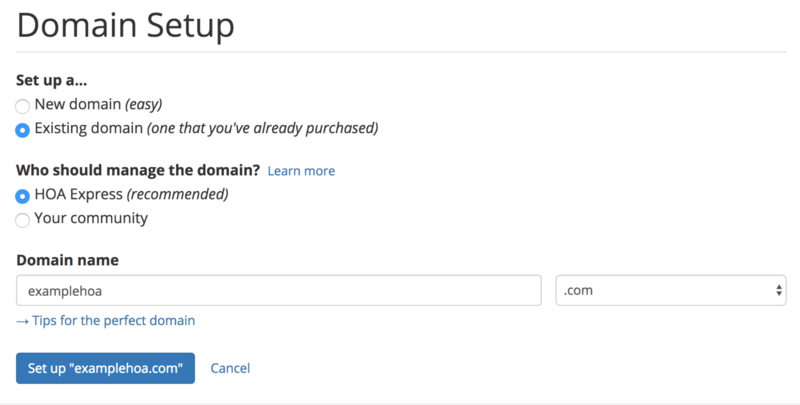 If you already own a domain you'd like to set up, follow the steps below. Note: If you purchased your domain from a domain provider less than 60 days ago, you will need to wait for this time period to end before transferring management to us. During this time, you can set up your domain and keep management with your community. On the "Domain Setup" page, select the "Existing domain" option. Decide on who you'd like to manage your domain; your community or HOA Express (recommended). For more information on the differences between these two options, please read the following article: Community managed vs. HOA Express managed domains. Enter your existing domain name and select the correct extension from the drop-down menu. Once you've finished filling out the information on this page, click the "Set up" button. Depending on who will manage the domain, some additional steps will be need to be completed. Return to the "Domains" section of the Admin Control Panel to view the next action required. How long does it take to set up a domain? For information on how long domain setups typically take, please refer to this help article: How long does it take to set up a domain?